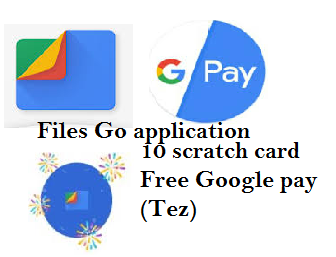 hello friend” Today you have a big booty offer for you Where you get 10 Scratch Cards on Google Pay (Tez), also absolutely free Without any transactions you will get 10 scratch cards Which you can scratch to win from one rupee to 100 rupees You will get 10 Scratch Rawat cards separately. You do not have to do any translation to take this scratch card. Just upload it to your 10 times different mobile phone. This photo video song will share anything you want with your friend or in different mobile phones.Will have to share. Files Go app After downloading, you can open it from the Play Store.I click on the share icon below Then click on the Start icon and login with the email ID from which you logged in with Google Pay (Tez) After that, you can share a file by clicking on the sand icon and receive it in another mobile to see that he has also logged in file which If he has not logged in, then neither of you will get a scratch card . If you like this post, then you can also subscribe to our website by submitting your email ID and if you like it then please share the Thank You and share the post.